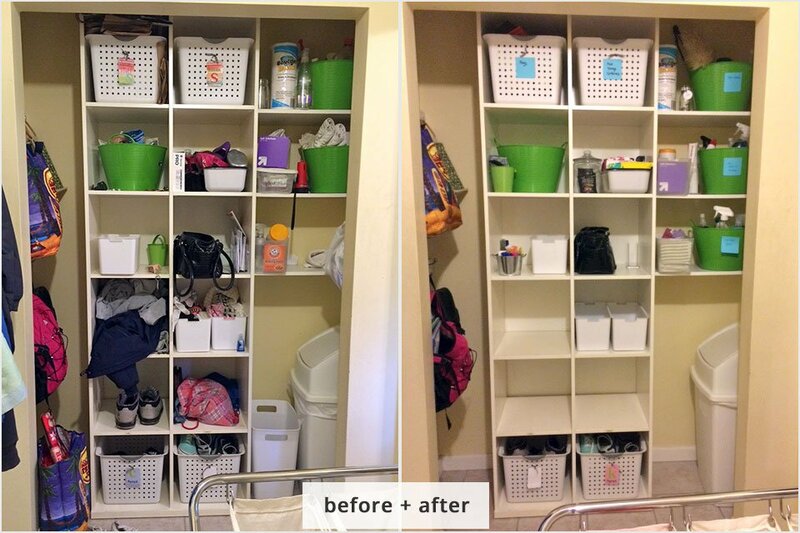 Home > Organizing Tips > Get Organized > Being Organized is a Combination of Getting Organized and Staying Organized. During last weekend’s Organize-athon, a participant commented that she was surprised to see that Jay and I had some organizing projects to do (both in preparation for the event, and while the event was going.) Her thinking was that we were already organized, so we wouldn’t have any projects to work on. These photos are a project I worked on during our Organize-athon. I was doing maintenance on an area of my laundry room. How much clutter is too much clutter for you? 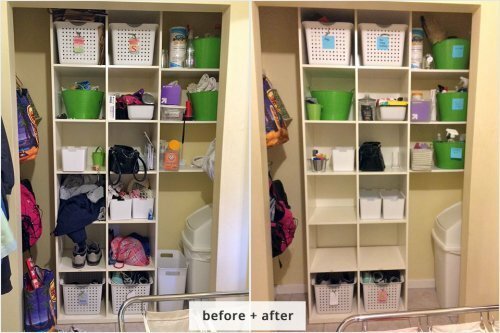 If you are bothered by visual clutter, then you will want to declutter more often. The important thing is to figure out what you’re okay with by answering the questions above. Then, create schedules and routines that help you spend more of your time in your comfort zone, and less time out of it. *Such* good points! Even professional organizers are real people and our houses are not always perfectly organized. And yes, we need to know our own comfort zones. My organizing preference is the opposite of yours–I prefer to be proactive. I’d rather keep the clutter at bay than tackle it after the fact. If only my family felt the same way! Visual clutter is extremely stressful for me, so I do all I can to minimize it. But a lot of what I do would not be worth the trouble for other people, who mind it less. It’s all about knowing what’s important to you. Thank you, Nancy! You’re so right. It really does come down to knowing what’s important to you. I think I am sort of a mix – I do go back to areas that may seem perfectly organized to some and do little adjustments. Would that be called pro active? Or does it mean my comfort zone in this particular area is very narrow? Or is it simply that I know these areas will give me a quick buzz – aaaah…. perfect order in just a few minutes? I definitely have chatotic spaces as well. They are either areas I don’t care as much abour or the chaos does bother me but to a point that they are a bit overwhelming. Rooms that are used less often, tend to become a bit of a catch all area where we need to go back in time and time again. And that is frustrating! Hi, Petra! I think it makes a lot of sense that you have different comfort zones in different areas of your home. I love that you have areas where you can get a quick organizing buzz! Great concept. I think it’s proactive if you’re taking action ahead of when it really bothers you…but I suppose it’s all a continuum. One person’s proactive could be someone elses’ reactive. I’m definitely not the pro-active type. I only react when I get too frustrated at not being able to find things, or in the case of spring, when it’s starting to get too warm. That’s when the clutter, that might have felt cozy in winter, suddenly makes me feel too hot and uncomfortable. And like you, I get the most satisfaction from a big, dramatic change. My sewing room is my Next Big Thing. It’s downstairs, where the temperature stays much cooler all year and I can work in comfort. After last weekend’s Organize-athon, the closet in there is beautiful. Now to make the rest of the room match it I was amazed at how few hours of concentrated effort I needed to make a big change. Anyway, super excited about your closet! Let me know when the rest of the room matches it. A huge part of organization is staying organized. To me, this tasks requires a constant effort to put things back where they below and proactively monitoring the space around me. There are parts of my house that I let go, and other parts that I keep clean and clutter free at all times. Thanks for sharing! Organization isn’t a one size fits all solution. Thanks for your comment Courtney! I completely agree that organizing isn’t one size fits all. Trick is to find what works for you. I find that there are certain areas that I need to keep organized because the visual clutter stresses me out. I always leave my office very tidy at the end of the day and I need my living areas to be clutter free. So I tend to be pretty pro-active. But I seem to have “zones” of clutter that I’m always trying to get on top of. There’s a desk in my bedroom that seems to collect clutter the instant I clear it off. It’s almost like it’s magnetic – LOL! And I like that you are honest about the fact that your home isn’t a perfect clutter-free zone. Thanks Veronica! I appreciate your comment – especially that last part. I think it’s so important that we find and do what works for us without the pressure of trying to live up to an unrealistic standard.